Warning! This article contains terrible illustrations! Several years ago, I was fishing a stream in the Smokies that I probably know better than any other. It was an early spring day and the water temperature was marginal at around 50-degrees, and the water level was a little high because of recent rainfall. I’d been fishing for two hours and hadn’t even had a strike. I knew it wasn’t a dry fly kind of day. Therefore, I continued to switch nymph patterns, trying to find something that would fool one trout. Eventually, I decided to stick with one fly pattern, a Pick Pocket, that I had a lot of faith in and to begin altering the way I fished it. Since it was an un-weighted wet fly, I already had one split shot about 8” above it. I began swinging the fly a little more, but the result was the same. Next, I added a second split shot and fished with a mix of swing and dead drift techniques. Nothing. Finally, I added a third split shot and hooked a fish on my second cast. I proceeded to catch another 30 fish or so over the next couple of hours. I should have known better but we all seem to get too caught up in fly patterns and lose sight of other important factors like drift and depth. Well, I had been fishing good drifts all day, but these fish were hugging the bottom. My fly was not getting, or at least staying, down in their feeding zone. Do you use split shot when you’re nymphing? There are definitely times when you need to. One of the best nymph fishermen I have ever fished with is Joe Humphreys. It is excruciating to watch him fish because every time he moves to a different spot, he adjusts the amount of weight on his line! But he often catches fish that others don’t because of those adjustments! Being willing to add or remove split shot to your line is the first step. Knowing where and how to place those weights is the next. For instance, if you put three split shot right next to an already heavily weighted fly, you may have a hard time keeping it off the bottom. So, you have to figure a lot of things, like how heavy your fly is, how deep the water is and how fast the water is. Just the weight of the fly may be all you need to get the nymph near the bottom in slow water, but faster currents may move that fly all over the place. Extra weight can be used not only to get the fly deeper, but also to slow the drift and keep things where they should be. Shot placement is tricky in places like the Smokies where depth and current speed can vary significantly, even in the same run or pocket. Short casts and good line control can significantly help combat this. Strategic split shot placement can also make a big difference. The closer you put the additional weight to the fly, the more you’re going to put the fly on the bottom. As a result, you’ll probably hang up more. 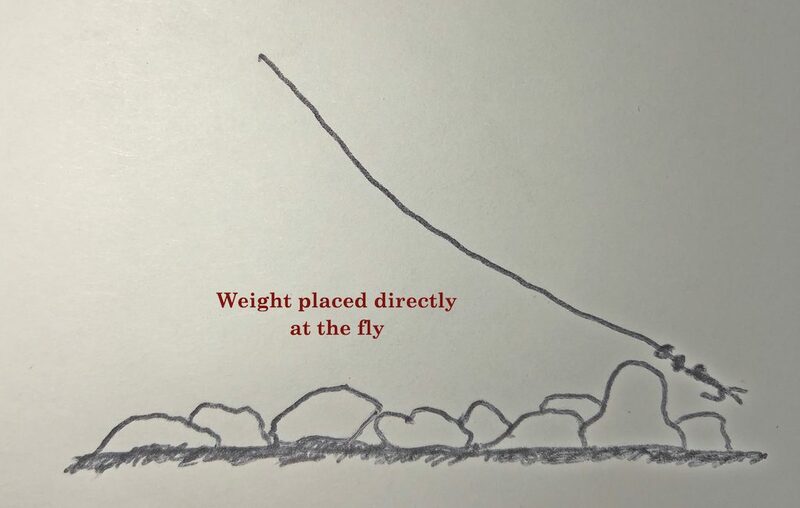 But if you put a concentrated amount of weight on a section of leader above the fly, that portion of leader will be what drifts deepest, and the fly will ride above it. 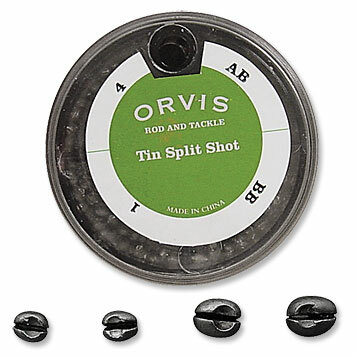 The farther the split shot is above the fly, the farther off the bottom the fly will drift. Of course, there are variables like how heavy the fly is and how much split shot you use. Sometimes you just have to play with it a little bit. When you get as good as Joe Humphreys, you can make those calculations in your head and adjust perfectly for each new spot you fish. Here are a few examples of how you might want to adjust your setup. The Clinch River often has long, slow slicks that maintain fairly consistent depths. Consequently, the weight of the fly alone should be sufficient to get and keep the fly where I want it. 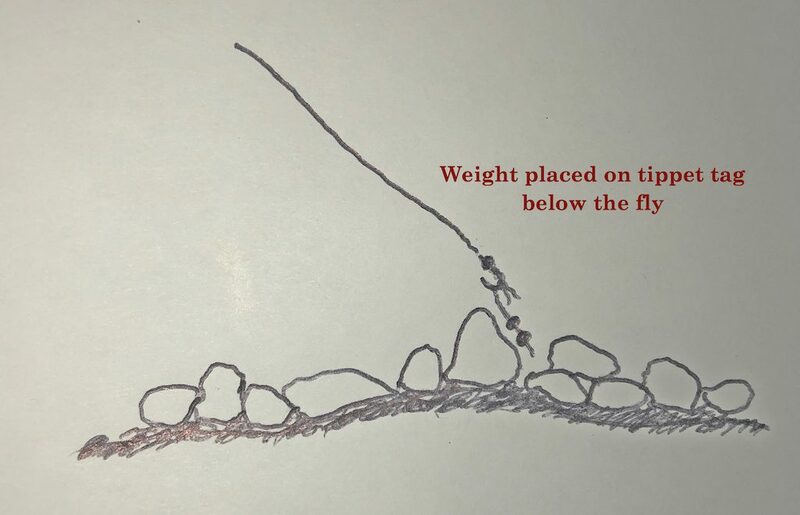 In a 6’ deep plunge pool in the Smokies, I’m going to need a lot of weight to get my fly deep and keep it there because of the water depth and turbulence. I’ll likely use a heavily weighted fly plus a few pieces of split shot placed near the fly. But fishing pocket water in the Smokies, the depth in one pocket probably varies from 12-24”, with a lot of fast currents. Here, I would probably use a lightly weighted (or un-weighted) nymph with one or two split shot placed 6-8” above the fly. This will keep everything down but allow the fly to drift just off the bottom where it won’t hang up as much. There is another method that some anglers use where a separate piece of tippet is added to the leader or to the back of the fly. The desired number of split shot are then added to that piece of tippet, allowing the fly to remain above the weight. It works, but I find that split shot hanging on a loose, vertical line like that have a greater tendency to get hung up and pulled off on rocks. As with most things, you sometimes have to play with a few methods and figure out what works best for you. 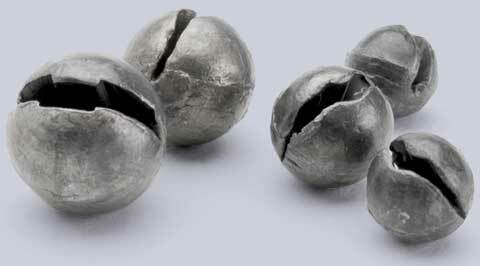 There are, of course, different sizes of split shot and what size you use can certainly determine how many you need to use. I typically use small to medium size shot because it gives me more flexibility and versatility to add or remove as needed. In any case, if you are only nymphing with a weighted fly under a strike indicator, you are just scratching the surface of nymphing. I encourage you to experiment with different amounts of weight and different weight placements. You’ll probably start catching a few more fish… and maybe a few bigger ones, too! If you’re new to the sport, sometimes it is difficult to navigate all of the terminology. 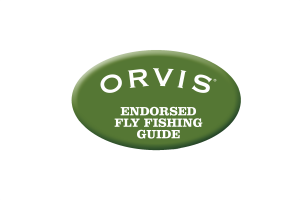 There is probably no facet of fly fishing where that is more complicated than in the world of flies. I’m not even talking about specific names of flies. That water can definitely get over your head in a hurry. Before you can even begin to make sense of those fly pattern names, you have to get a handle on the more general categories under which they fall. And that’s what we’re going to tackle here. Let’s start with the term flies. I frequently hear it misused as its own separate category. For instance, someone might ask me if we’re going to be using flies or nymphs. That’s kind of like asking if you have a poodle or a dog. Of course, a poodle is a type of dog. And a nymph is a type of fly. Regardless of what it is supposed to imitate, any lure that we fish with a fly rod is generically referred to as a fly. Flies are then broken into more specific categories. While it can certainly be broken down to more specific sub-categories, the main category of Dry Flies refers to any fly that is designed to float and be fished on the surface. This would include something like a Parachute Adams that might represent some sort of adult mayfly. It would include a Dave’s Hopper that imitates a land-based grasshopper that has ended up in the water. Or it could even be a large, hard-bodied popping bug used for bass fishing. One might fall under the sub-category of Trout Flies, another under Terrestrials, and another under Bass Bugs. But they are all flies because they are fished on a fly rod and they are all dry flies because they float on the surface. Nymphs are a category of flies that you typically fish under the surface and more specifically; they imitate the juvenile stage of an aquatic insect. A Tellico Nymph, for instance, represents the juvenile stage of a stonefly. A Pheasant Tail Nymph imitates, most often, the juvenile stage of a mayfly. Most nymphs drift helplessly in the current and we use tactics that allow our imitations to do the same. To confuse things a little, some flies that don’t imitate juvenile stages of aquatic insects get lumped into the nymph category because they are fished like nymphs. For instance, a Green Weenie is a representation of an inchworm that has fallen into the water. Though an inchworm is obviously not a juvenile stage of an aquatic insect, when it falls in the water, it sinks and drifts helplessly with the current. So, you fish its imitation like a nymph. Sowbugs and scuds are other good examples of this. They are actually crustaceans that will never hatch into an adult that flies from the water. But their imitations are most often fished like other nymphs, so they fall into the nymph category. 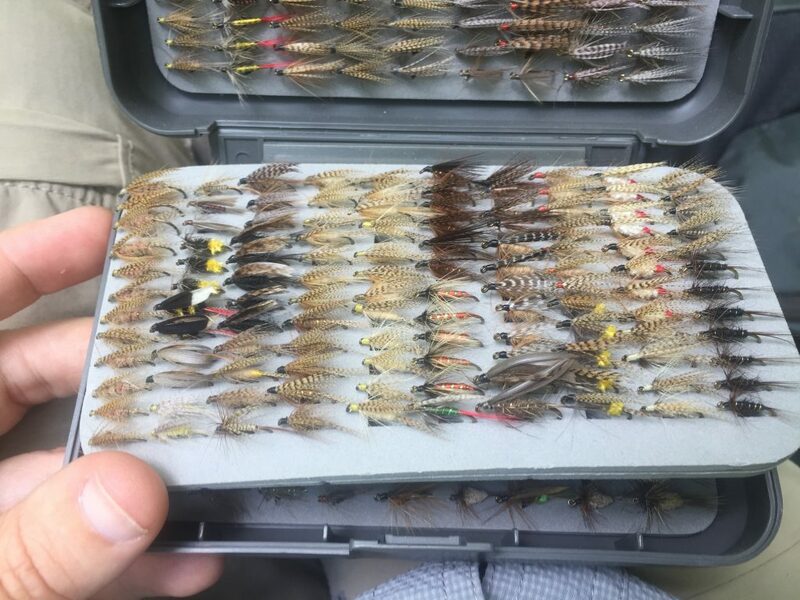 The category of Wet Flies is a little confusing and could probably be more of a sub-category of Nymphs – or vice versa. Wet flies are usually not tied with materials that allow them to float. They are also not really designed to sink. Rather, they often have a soft hackle that provides a lot of motion and you commonly fish them on a swing rather than a drift. So, you mostly fish them in, or just under, the surface film. 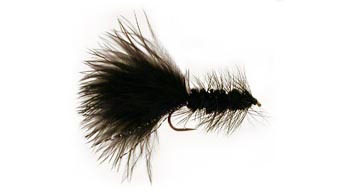 A wet fly could imitate a variety of things. Mostly they are suggesting a mayfly or caddisfly as it is emerging to hatch. Streamers are also flies that sink but more specifically, imitate things that swim. Again, anything you fish on a fly rod is generically referred to as a fly, but these flies represent things like minnows, crayfish and leeches. So unlike nymphs that you usually fish on a dead drift, or wet flies that you usually fish on a swing, you typically strip and actively retrieve streamers through the water. So you can take all of the flies that are out there and lump them into four categories: Dry Flies, Nymphs, Wet Flies and Streamers. Now, you can take all of those and split them into another two broad categories: Naturals and Attractors. A Natural is a fly that specifically imitates something that exists in nature. A Blue Wing Olive dry fly specifically imitates a Blue Wing Olive mayfly adult. The Hot Flash Minnow Shad is a streamer that specifically imitates a threadfin shad. A Green Weenie imitates an inchworm. They’re all fly patterns intended to represent something specific. You most often fish naturals when fish are keyed in on a specific food source and you know what it is. If there is a big hatch of Blue Wing Olives, trout may not eat anything that doesn’t look like a Blue Wing Olive. Or because stripers are working a school of threadfin shad, they may not consider anything that doesn’t look like a threadfin shad. Attractors are flies that don’t look like anything in particular. They are also sometimes called Generals or Prospecting Flies. They might just be something very generic that looks like a lot of things. Or they might be something that doesn’t look like anything at all. They may just have a certain color or other trigger that generates a feeding response from a fish. Most of the time, you are fishing with attractors, especially in places like the Smokies where fish are more opportunistic. 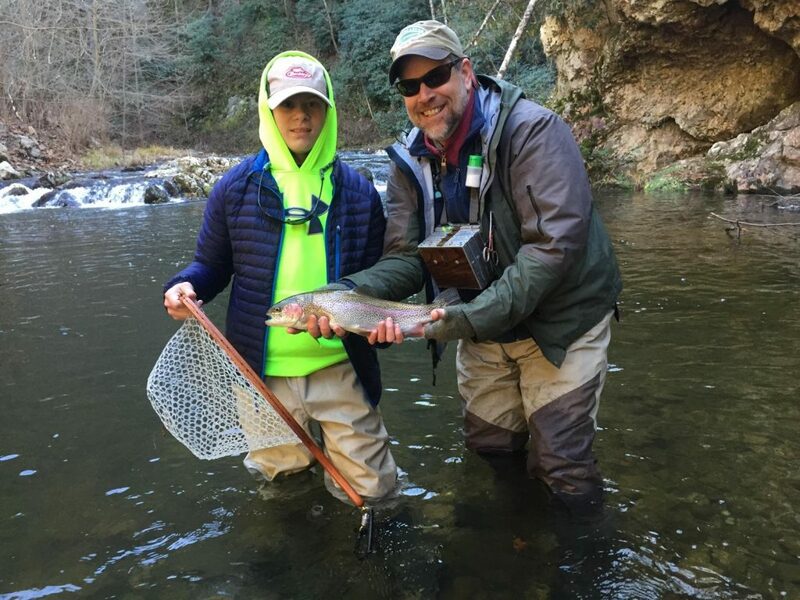 There are rarely big enough hatches in the Smokies to allow a fish to efficiently key on one particular bug. You fish things like a Parachute Adams because it resembles a lot of things fish might see on the surface. Or you fish a Prince Nymph because it has characteristics that trigger a feeding response from a fish. 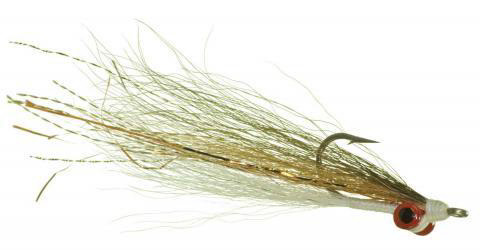 If you’re fishing for smallmouth and you’re not sure what they’re feeding on, you might tie on a Wooly Bugger. Depending on its color scheme and how you fish it, it could pass for a minnow, leech or even a crayfish. Essentially, it just looks like something to eat. Yes, flies and the vocabulary that describes them can be confusing. Hopefully this article has helped a little. Don’t get frustrated. Embrace and enjoy the chaos. It’s all part of the fun! 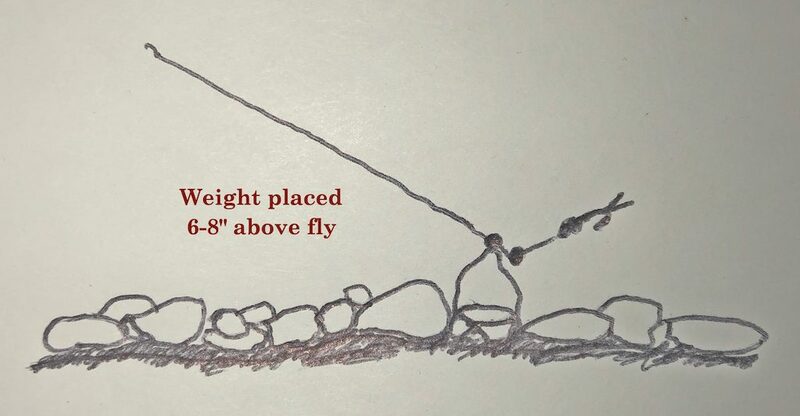 Whether describing a nymph, dry fly or streamer, an “attractor pattern” refers to a fly that doesn’t really imitate anything in particular. It could be that the fly is relatively generic and looks like a lot of different things. 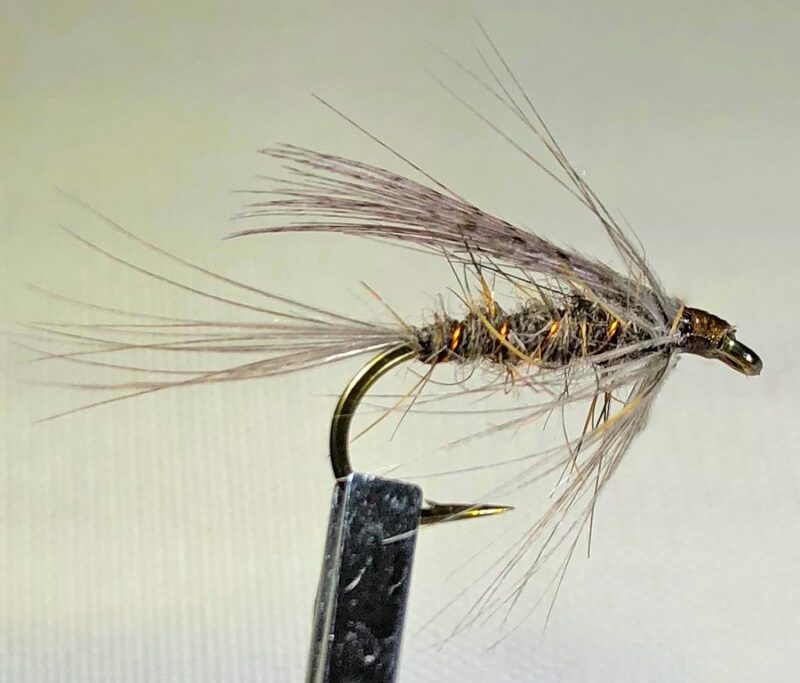 An Adams dry fly, a Pheasant Tail Nymph or a Wooly Bugger would all match that description. An attractor could also be a fly pattern that really doesn’t look like anything at all. I think the Prince Nymph definitely matches that second description. Its body, hackle and general color scheme might suggest some sort of mayfly nymph or caddis larva. Though it’s thick, split tail is more reminiscent of a stonefly nymph. But those white “horns” on the back? While I don’t know of any aquatic insect that has anything like that, perhaps it is suggestive of the white back on an Isonychia nymph. But there certainly don’t need to be Isonychia nymphs present for this fly to work. That’s because this fly works well nearly all of the time and in most any environment. 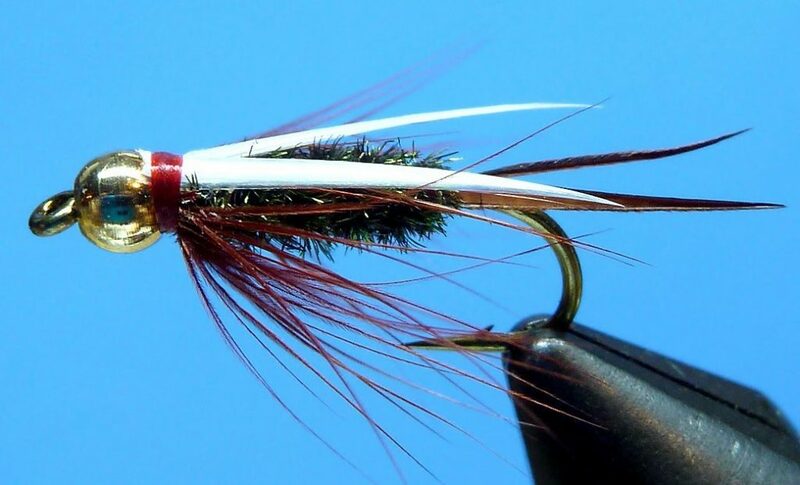 In mountain streams and tailwaters, this fly catches trout. 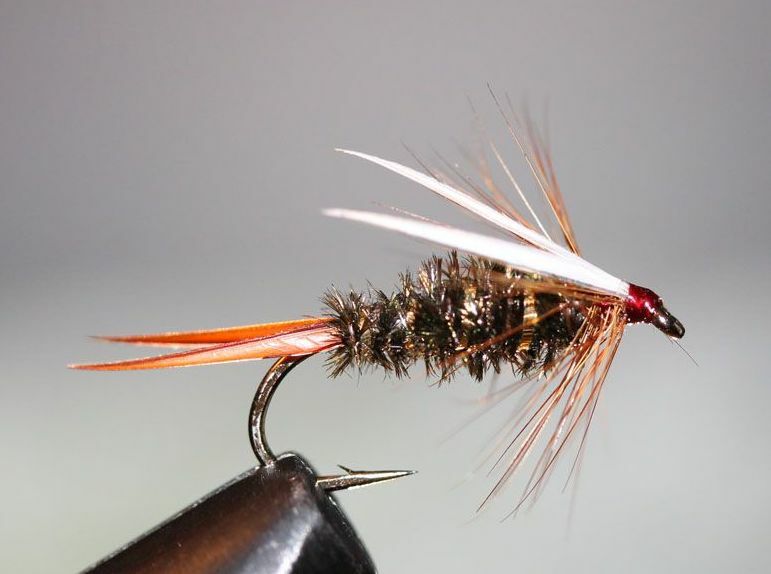 In spring, summer, fall and winter, this fly catches trout. It’s no wonder this is one of the most popular nymphs of all time and why it would be on nearly every trout fisherman’s must-have list. Nobody seems to care what it imitates or if it makes sense. Because it makes sense to the trout and that’s all that matters. Apparently, it also made sense to Doug Prince, the originator of the pattern. 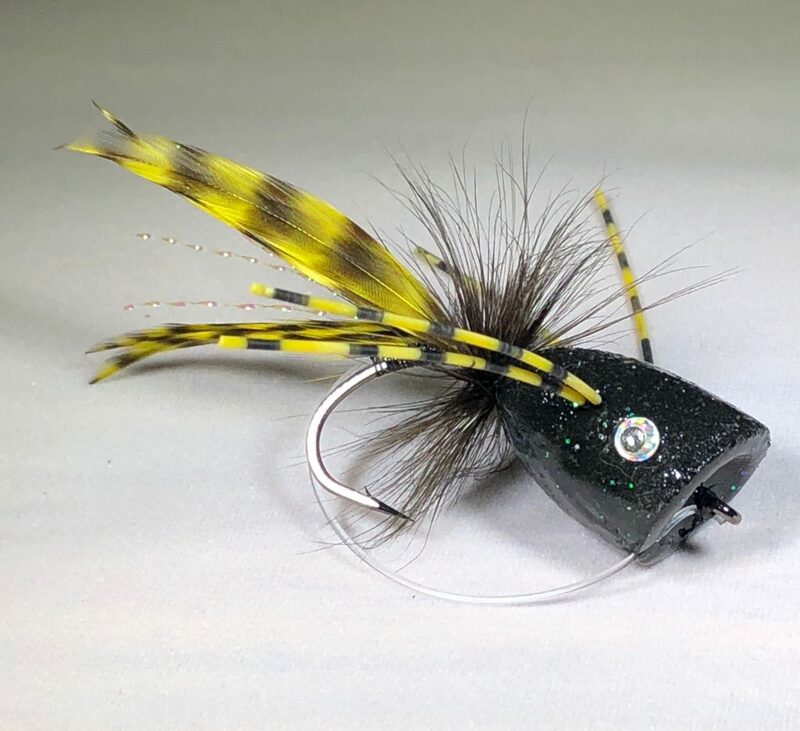 Doug was an innovative fly tyer who didn’t get a lot of recognition because he mostly tied for himself, rather than producing fly patterns for shops and catalogs. It is believed that he created the Prince Nymph sometime in the early 1940’s. He called it a Brown Forked Tail Nymph and fished it primarily on the King’s River in California. One of Doug’s fishing buddies was Buz Buszek, a fly shop owner in California. Apparently Buz was in a rush one year to put out a catalog and wanted to include a peacock body nymph pattern. He decided to use Doug’s pattern but couldn’t remember that it was called a Brown Fork Tailed Nymph. He did, however, remember that it was Doug Prince’s pattern, so he put it in the catalog as the Prince Nymph. The name stuck. Because of its popularity, there have been countless variations of this fly over the years. Everyone seems to think they can take a great fly and make it better. While some are made with wire bodies and some have rubber legs, others use a flashy dubbed body or have a flashy, reflective material on top, in place of the traditional white goose biots. One of the earliest and probably most popular variations was the addition of a bead head. Over the years, I’ve had success on most all of the variations. But in my opinion, nothing beats the old standard for catching fish in the Smokies. I tie and fish them in sizes #16 – #8, but most often use a #14. And I have success with them all year, but seem to do best with them in the “fringe months,” when the water temperature is a little colder than ideal. In fact, the Prince Nymph is one of my most productive winter patterns, fished deep and slow. So, if you’ve done much fly fishing, you likely know this pattern already. If not, definitely add some to your fly arsenal. The pattern for the traditional version is included below.